Several hills parties including Gorkha Janamukti Morcha (GJM) and Gorkha National Liberation Front (GNLF) took out the processions but there was no report of any violence or arson. 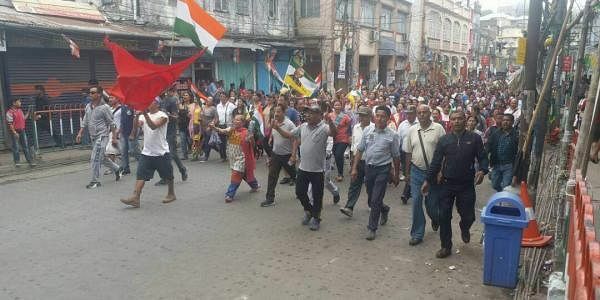 DARJEELING: The GJM activists and those of other parties today on the 42nd day of indefinite shutdown in the Darjeeling hills took out processions in its various parts, flaying the Centre for ignoring people's aspirations for a separate state. "The Centre should respect the aspirations of the people of the hills for a separate Gorkhaland. When they (Centre) are well aware of the ground realities, they should respect it,"
GJM general secretary Roshan Giri said hitting out at the BJP-led government. The comment comes a day after Union Minister of State for Home Affairs Hansraj Gangaram Ahir told Parliament in reply to a question that there was no proposal to form any committee to look into the demand for a separate state for the Gorkhas and others agitating in Darjeeling. "The BJP is making fun of us with such statements. This is an indication that they are not giving importance to our demand. If they think that they can get away with making only false promises to us during elections for the sake of votes, they are wrong. The people of the hills will give them a befitting reply," a senior GNLF leader said. The 42-day-long shutdown till now has emerged to be the second longest so far in the picturesque hill station, which had witnessed a 40-day bandh in 1988 by Gorkha National Liberation Front and a 44-day shutdown in 2013 by Gorkha Janamukti Morcha on the statehood issue. The ban on internet services which was imposed on June 18 was extended by the district administration yesterday till August 4. The police and security forces patrolled the streets of the hills and kept a tight vigil at all entry and exit routes. Except medical shops, all business establishments, restaurants, hotels, schools and colleges have remained closed since the shutdown began. With food supply severely hit due to the indefinite shutdown, the GJM and various NGOs of the hills have been distributing food items among people. West Bengal Director General of Police Surajit Kar Purakyastha, who was camping in North Bengal for the last few days, told newsmen at Bagdogra on his way back to Kolkata that the situation in the hills is under control and the administration is committed to provide security to the peace-loving people of Darjeeling. Nobody would be spared if they try to resort to violence in the hills, he added.